I’ve always been involved in some form of sport and fitness since an early age. I’ve played club soccer since the age of nine and have participated in many other sports over the years, such as boxing and martial arts. Before I moved into Personal Training, I was also a Martial Arts Instructor and a Sports Coach. My passion for helping people improve their physical fitness grew during my coaching career, but an even deeper desire came after I lost my own mother. She passed during an otherwise simple operation but had complications, which the doctors believe was due to her weight issues. My interest in fitness also stems largely from my father who has always been my inspiration. He has been a Scout Master, a Sports Referee and a Coach, and at the age of 80, he still continues to make exercise and physical activity an essential part of his life. My favourite thing about training people is the joy that is brought to their face when they lose weight and tone up and realise that a better physique isn’t out of their reach. I love helping people with weight loss, toning, and body transformations. Tricep exercises – I think this is one of the most important areas to tone, as almost two-thirds of the arm is tricep muscle. On Saturdays, I often love venturing to Water Theme Parks and the Beach. Most Sundays I quite enjoy staying at home to catch up on quality family bonding. My favourite food is lasagne. But, I also enjoy growing and eating my own fruits and vegetables. My favourite exercise is T-Bar Rows. I love the feeling of working the back. It feels so different from the way other muscles feel when they are worked. On weekends I enjoy swimming, bike riding, and my most favourite place I enjoy going to is the beach. I’m a very active guy who enjoys the outdoors. I have watched my father change countless lives over the years through personal training, and that inspired me to become a personal trainer too. I love helping people with their weight loss issues, and I really enjoy watching their faces light up when they realise that exercising can actually be fun. It’s been so rewarding for me to help people lose some pretty big numbers. My largest weight loss for a client to date is 25 kg, and I’m looking forward to improving it. I’ve always enjoyed being active and looking after my health. When I was younger, I played team sports such as soccer and studied martial arts. I also have a real interest in anatomy and physiology. What the human body is capable of never ceases to amaze me. Working at Striders is so challenging and rewarding. There isn’t a day that goes by where I don’t look forward to working here. Growing up I spent every spare moment playing sports swimming, netball, surf life saving and martial arts. Then after having my two children I found myself overweight and unhealthy and soon realised something had to change. I was quickly reminded of the positive effects exercise has on my own physical and psychological well being and found my passion for Nutrition and Fitness all over again. Working at Striders allows me to share that enthusiasm and knowledge with others and inspire them to become a fitter, stronger version of themselves. I believe education, motivation and inspiration all work together for overall success. Personal Training allows me to help teach proper health and fitness techniques and how to incorporate them into the daily life. My favourite thing about training is building relationships and connecting with people one on one. I enjoy helping them achieve their personal goals, no matter how big or small. Rear Squats – I love the full body workout this exercise gives. Play netball, watch and coach my kids sports. I love spending time with my family at the beach, jet skiing and camping. “Believe in Yourself and You Will Be Unstoppable”. My most favourite exercise is deadlifts. They can really take a person to their maximal effort, but they always give me a great feeling of accomplishment after. On weekends I enjoy going swimming, time at the beach, and spending time with friends. “No one ever won a purple heart hiding in a fox hole”. My passion for health and fitness stems from my parents, who taught me to value and appreciate it. Growing up and seeing the unwavering passion and discipline my parents put into exercise and eating right made me realise the importance of doing the same. So I joined the Striders Team to pass on my knowledge and help other people achieve their own fitness dreams. Through the knowledge I have gained at Striders, I have seen my body transform remarkably. The friendly studio environment, and the way people all encourage and support each other to achieve their goals is something that really appeals to me. I love the positive vibes here. The thing I like most about training clients is sharing my knowledge with them and helping them achieve results that they’ve wanted for so long. I have been actively involved in playing sports since an early age. over the years I have participated in netball, horse riding, dance competitions, and triathlons. I started training at Striders Personal Training seven years ago and with the knowledge of the trainers for exercise and nutrition, working out became fun, and I got down to my goal weight – losing 20KG. 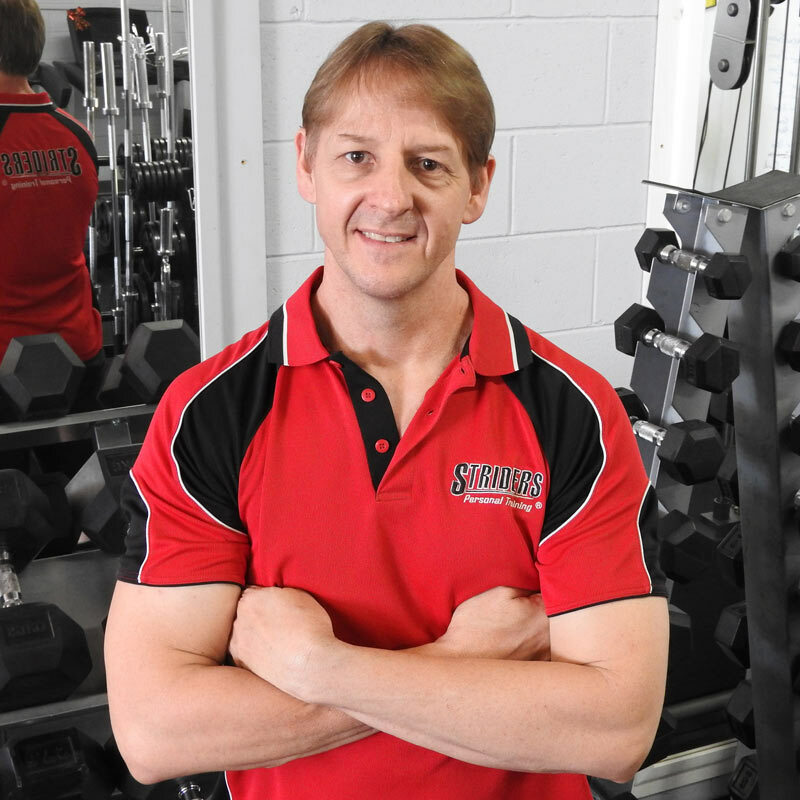 Seeing the focus and dedication I was putting into my training – as well as me helping other clients – the management at Striders asked if I wanted to join the team… and I haven’t looked back. I love interacting with clients, and helping them to overcome any obstacles they face along the way. Seeing them so proud of their accomplishments, their physical transformations, and being able to cheer them on is the greatest feeling. Working at Striders is very inspiring and the team is very supportive and dedicated to ensuring the best for everyone. I have a strong interest in sports injuries and physiotherapy, and I’m looking forward to expanding my knowledge in these areas. Deadlifts – They work your whole body and gets your heart rate up. It’s a great exercise for muscle toning and calorie burning. I love walking my Border Collies: Kayla and Jack, and catching up with my friends. I’m also preparing to train again for Triathlons. As the administrator at Striders, I enjoy meeting and working with all the wonderful people who come through our doors. I’m here to help with any questions you may have along the way. I have always been an active person from as far back as I can remember, and over the years with Striders, I have gained an even deeper appreciation for exercise and healthy eating. The greatest part about being at Striders is joining with people on their journeys, going through the ups and downs, and seeing the transformations that take place, not just physically, but also emotionally. You see people start to believe in themselves, and really have fun with their lives, and watching that spread throughout the studio onto their families is very rewarding. For me, Striders is like a big family, we all come together and support each other, laugh with each other, and sometimes cry. But that’s what life is – a great learning and growing experience, and I love sharing that with others.